Runners Need 15% voucher code off any items found on our website store. 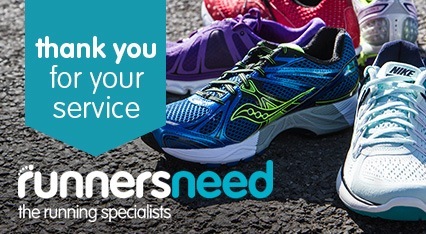 Runners Need have the largest range of running gear and quality service to boot. This voucher code is valid for serving members, ex-forces and family members. Be sure to check out our clearance items under the tab on our site too. 1. Click 'Get Code' to get the voucher code and open the Runners Need site. Runners Need is a store designed especially to meet the needs of runners. It was founded more than 30 years ago by runners. They have 31 shops across the U.K. as well as a full online retail store. Runners Need provides the highest quality gear for all of your running needs including top brand running shoes, GPS, watches, and so much more. Runners Need has the latest running clothes. They provide the latest in sportswear that will keep you looking good, feeling good, and keep you moving no matter what type of whether you are running in. Their shoes from brands such as Nike, Adidas, and Asics are built to last mile after mile. Their in store staff are all passionate runners who are able to provide expert advice on the best products from shoes to electronics. Visit one of their locations for in store services such as gait analysis and LGN Wellbeing training sessions. In addition to these great services they host running events throughout the year. If you are not able to make it to one of their stores you can find much of the expert advice you would receive in store on their “Expert Advice” page online. Normal refund policy applies. Offer not open to employees of the Snow+Rock Group. Promoter: Runners Need, The Rock, 2 Thornberry Way, Guidlford, Surrey, GU1 1QB.